The Unitarian Universalist Association (UUA) and UU Service Committee (UUSC) begin their advocacy today at the 24th Conference of the Parties (COP24) of the United Nations Framework Convention on Climate Change (UNFCCC) begins today in Katowice, Poland. Agreement to the so-called Paris Rulebook, the implementation plan for the 2015 Paris Agreement, which would define the rules by which countries will measure and report emissions, climate action, climate finance and adaptation to climate change. Adopt the Task Force on Displacement’s recommendations for integrated approaches to avert, minimize and address climate related displacement or migration. “The latest Intergovernmental Panel on Climate Change Special Report on Global Warming of 1.5°C makes our dire situation clear,” said UUSC Senior Partnership Officer for Climate Justice and Crisis Response Salote Soqo. “Definitive, urgent and longer-range actions can’t proceed without these linchpin agreements in place. “Unfortunately, the U.S. backed out of the Paris Accord and is no longer a world leader in a commitment to slowing global warming—despite its daunting new climate report by 13 federal agencies that was issued—and obscured—over the Thanksgiving weekend,” she said. Read more about UUSC’s advocacy priorities at COP24 in their Nov. 30th press release. The UUSC will have an info-table about their climate forced displacement justice initiative for the first week of COP24 and is co-hosting a side event on Tuesday, Dec. 4th called Climate Forced Displacement: Advancing Human Rights and Justice (link to video), featuring speakers from the Alaska Institute for Justice, Tuvalu Climate Action Network, ActionAid International, and UUSC. The UUA has been active as an observer organization and faith advocate for ambitious and just climate action at the UNFCCC climate talks every year since 2015, when the Paris Agreement was established. Unitarian Universalists are one voice among a strong Interfaith presence at the UN climate talks that will be engaging in worship, dialogue, and faith-based advocacy for ambitious and morally grounded climate commitments. Bruce Knotts is the Director of the Unitarian Universalist United Nations Office. He was born and raised in Southern California. He got his Bachelor’s Degree in History from Pepperdine University and his Master’s Degree in International Education from the Monterey Institute of International Studies; both in California. Bruce was a Peace Corps Volunteer in Ethiopia. He worked for Raytheon in Saudi Arabia and on a World Bank contract in Somalia, before he joined the Department of State as a U.S. diplomat in 1984. In 2004, Bruce was elected to the Board of Gays and Lesbians in Foreign Affairs Agencies (GLIFAA). 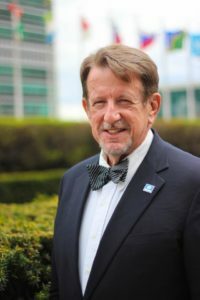 Bruce retired from the Foreign Service in 2007 and joined the Unitarian Universalist United Nations Office as its Executive Director at the beginning of 2008. As senior partnership officer for climate justice and crisis response, Salote Soqo works to identify, develop and evaluate a human rights portfolio focused on environmental issues affecting vulnerable individuals and communities, with special emphasis on resource rights such as the human right to water, food sovereignty and climate change. Before joining UUSC, Soqo worked as a regional program coordinator in water equity and climate justice for The Environmental Justice Coalition for Water (EJCW). She was also the climate and carbon management fellow with EJCW and the Carbon Cycle Institute (CCI); prior to that, she worked as an environmental consultant in Fiji. Soqo attained her undergraduate degrees from the Auckland University of Technology in New Zealand, and the University of the South Pacific, in Fiji. She also holds a master’s degree in environmental management from the University of San Francisco. 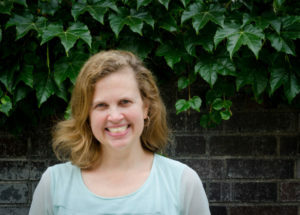 Meredith Larson is UUSC’s Director of Advocacy and Strategic Communications. In this role, she supports and manages the organization’s advocacy, organizing, and strategic communications team and collaborates across teams to lead UUSC’s advocacy work. Prior to assuming this position, Larson led advocacy campaigning on humanitarian crises for Oxfam America and served as the director of the Alliance to End Slavery and Trafficking for Humanity United. Before that, she served as Campaign Director with Amnesty International USA, leading advocacy campaigns on human rights issues in the US and internationally, including violence against women, country-specific crises, the arms trade, and children in US immigration detention. 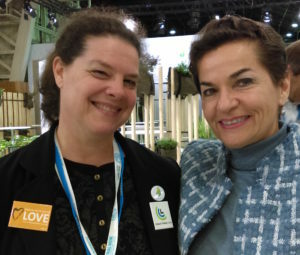 Doris Marlin (pictured on the left, posing with Christina Figueres, former Executive Secretary of the UN Framework Convention on Climate Change) will be attending the UN climate talks as a UUA observer for the 3rd time at COP24. She also was an instrumental organizer in passing a UUA Action of Immediate Witness calling for a “support a strong, compassionate, fair, ambitious, binding, and enforceable international climate agreement” in 2015. Marlin has been a longtime UU volunteer leader and advocate for climate action with numerous organizations, including the All Souls Unitarian Church of D.C.’s Green Souls group, Unitarian Universalists for Social Justice (UUSJ), UUA Green Sanctuary Program Advisory Board, and UU Ministry for Earth. 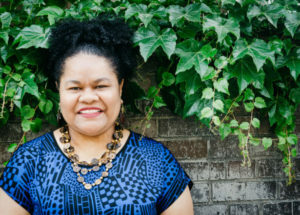 Claudia Keith, an active member and supporter of UU Ministry for Earth and the Climate Justice Council of the UU Fellowship of Corvallis, Oregon, will also be attending the COP24 as one of four observers representing the League of Women Voters – US. UUA credentialing was also used to support the attendance of the Alaska Institute for Justice (a UUSC partner organization) Executive Director, Robin Bronen, JD, PhD. UUSC partners with the Alaska Institute for Justice (AIJ) to support Alaskan tribes on the frontlines of climate-forced displacement and recently partnered with AIJ to host an international First Peoples’ Convening on Climate Forced Displacement, where a powerful declaration and call to action for the UNFCCC and government leaders was established.